No, there isn't a deal for the Formula One German Grand Prix yet, either at Hockenheim or at the Nürburgring. That being said, Nürburgring official Carsten Schumacher admitted to Swiss mag Motorsport Aktuell that the circuit is willing to host the grand prix at a financial loss—provided they can eat the cost. "We have said that, for the sake of the fans and the region, we are prepared even to make an economically acceptable loss," Schumacher told the Swiss magazine Motorsport Aktuell, as quoted on GrandPrix.com. What's troubling about this statement is that it suggests that it's no longer financially viable for the Nürburgring to hold a grand prix and actually make any money off of it. They're offering it as a service to fans, but assuredly won't make money given the fees and preparation that Bernie requires of venues willing to host the grand prix. Schumacher explained to the Swiss publication that this financial crunch is the reason why the Nürburgring has offered to let Ecclestone step in as promoter for the race. The 'ring can't afford to take on those duties themselves. "There is no question that, as a Formula One organizer, you deserve to make money, but the problem is the entry fee and we need to talk about that," Schumacher continued. "I think it makes little sense to organize events in which you only spend money rather than making any. In the long run, no one can afford that, and that includes any other race track in Germany." Schumacher's comments also imply that Hockenheim is having the same problem coughing up the dough. 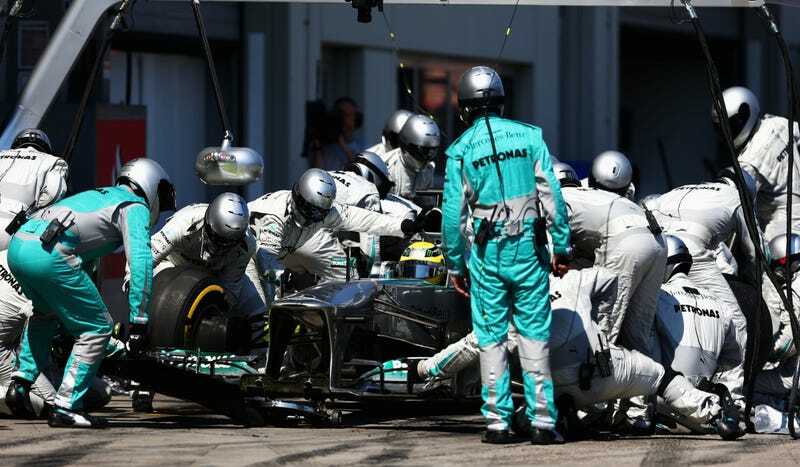 It's not just the teams who are feeling the effect of rising costs surrounding Formula One. Venues, too, are getting the squeeze. Losing venues people actually want to watch because of ever-increasing fees is a huge problem. Sure, both German venues have been a bit neutered from their former glory over the years, but they're smack-dab in the home country of several of its drivers as well as Mercedes-Benz themselves. As venue fees go up, though, so do ticket prices, which is pricing out many fans who would otherwise go and keep the race afloat. Consequently, attendance has fallen at the German Grand Prix in recent years, giving F1 less of a reason to work with either Hockenheim or the 'Ring. It's a vicious cycle. At least they solved that nonexistent helmet problem, guys!